Good to see the introduction of Jojen and Meera Reed. Not at all how they come into play in the books, but at least they fit them into the show. Also, I always like the Queen of Thorns in the books and now she's in the show too. You can tell that the kid actors are growing up. Both Bran and Arya you can tell are a lot taller and look older than when the show started. And Bran's voice sounds different too. wags83 wrote: You can tell that the kid actors are growing up. Both Bran and Arya you can tell are a lot taller and look older than when the show started. And Bran's voice sounds different too. This is all I could think the entire episode. Wow. Even bigger of a difference then I was picturing. wags83 wrote: Good to see the introduction of Jojen and Meera Reed. Not at all how they come into play in the books, but at least they fit them into the show. Reeds were the sister/brother that were seeking after the young Stark boys, right? Queen of Thrones? I must have missed that. I got distracted with Roscoe and his opossum. Yeah, the Reeds are brother/sister with Bran and Rickon. And the Queen of Thorns is Margery Tyrell's grandmother that was talking with her and Sansa. 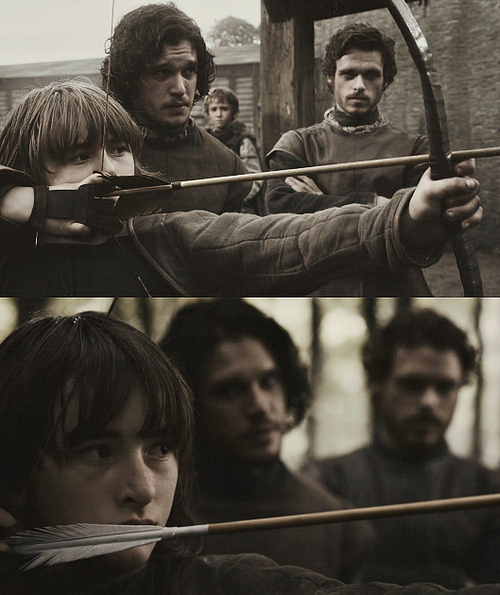 kcweaver wrote: Yeah, the Reeds are brother/sister with Bran and Rickon. And the Queen of Thorns is Margery Tyrell's grandmother that was talking with her and Sansa. Ah. I follow now. Thanks!